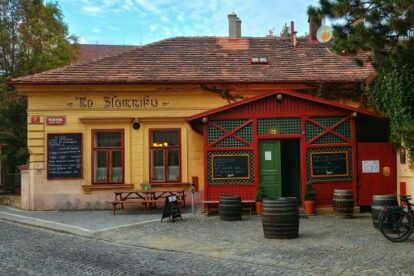 This may sound crazy but Na Slamníku may be one of the oldest existing pubs in the Czech republic AND a key element in Czech music history AND a great place to eat AND a perfect place to stop by just for a great beer – all this at one place. Na Slamníku is a pub with hundreds of years of history that was recently reconstructed and refurbished. For years it used to be a really basic, ugly pub and a punk concert venue (I lived nearby so I know) and it became a really nice, authentic Czech old-time pub with historic interior and great food and beer. There is the big Stromovka park nearby and Na Slamníku has a really big summer garden, so it is no upscale place. People are coming for a beer from the park, stopping by for a soup on a bike or relaxing in the shade of the big trees in the garden with their kids. During the day, you can enjoy their great Czech cuisine – and I have to say that they have really great desserts! – and in the evenings, there are music events. Great place to go to any time of the year.